The K-12 Education System implementation is now on its 3rd year in the Philippines and still, many people are not convinced about its relevance. The recent addition of two more years to the existing 10-year basic education curriculum. This means that students will not be accepted into 2016 college school year unless they finish grades 11 and 12. With the new program in place, the Philippine education system is expected to be at par with international standards. The government sees it as a key to our nations development. The K-12 education system will benefit our future leaders. With K-12, the focus in more on performance rather than cognitive skills. Students can acquire Certificates of Competency (COC's) and TESDA National Certifications (NC's) which allow graduates to acquire middle level skills that will in turn allow them better opportunities to be gainfully employed or become an entrepreneur. “Senior high school will allow our graduates to meet the global standard requirement of twelve years of basic education. It will let Filipinos be globally competitive. Those who want to work abroad will not have to take additional state examinations or certifications and will receive commensurate compensation,” rationalizedEngr. Mike Tan, Global City Innovative College (GIC) President, during a meeting with a group of parent writers. “It will still be like high school but with specialization. The curriculum will be geared towards the student’s interest. The specialization will be reflected in the student’s choice of tracks and strands. The tracks and strands offered at GIC prepares students better for specific college programs. So the students move up to the next level better equipped,” explained Dr. Gerry De La Zerna, GIC Chairman for Senior High School. The track is similar to what we refer to as ‘course’ in college while strands are similar to what is called ‘major’ in college. GIC offers Academic and Tech Voc tracks. Under the Academic track they have three strands: Accountancy Business and Management (ABM), Science Technology Engineering and Mathematics (STEM) and Humanities and Social Sciences (HUMSS). Under the Tech Voc track, they have two strands: The first is Home Economics which includes pastry and bakery production; food and beverages; and tour guiding and tourism promotions. The second is Information and Communications Technology (ICT) where they have animation, computer programming and medical transcription. “GIC wants to play a role in the country’s new education framework and do our share in bridging the gap between the high school and the tertiary levels. We also see this as an opportunity to cascade our approach to education to more students,” related Mike. “We employ 21st century learning. We offer a kind of education that addresses the needs of students to thrive in the future. We teach timeless skills that will serve as a strong foundation regardless of what the future holds. This is done through holistic and innovative education,” he continued. Students who enrol in GIC will have a unique 3D experience – discover, develop and direction. “We believe that these 2 years are critical yet confusing to a young student’s life stage. GIC’s 3D approach will help them discover their innate talents and gifts. Our unique enrichment programs for grades 11 and 12 aim to develop these talents and gifts by honing them with the needed skills needed for the 21st century. Finally, GIC will help them determine and focus on the direction to take for the important life choices they will make for their career or further education. This innovative approach will be rooted in the 21st century education framework and fully compliant with the requirements of the Department of Education,” Mike guaranteed. Education the GIC way sounds really fun! Students will be thrilled that they will not be given assignments to bring home. “We want our students to do the assignments in school. We want them to be well-rounded and enjoy their social life and family life,” shared Gerry. And there will be only four days of school. “The fifth day will be spent as immersion in their industry of choice. For example, if the topic is about interviews, we will let them spend the fifth day of the week going on interviews. We want them to get the experience so that when they return to the classroom, they will understand the discussion better. If it’s all lecture then everything remains abstract. They will not comprehend until they go through it. And the experience will make them remember better,” justified Gerry. The GIC teachers are industry practitioners who can provide real life examples and impart their experience from the field. After graduating from Senior High School in GIC, students can explore three options. They can move up to college for higher studies and pursue the specialization track taken in senior high school. No entrance exam if they enrol in GIC! Or they can get a job armed with a TESDA certification (when applicable) of the chosen specialization in senior high school. However, with this, their chances of moving up will be limited to middle management positions at the most. Because companies usually require a college degree for promotion to higher levels.The third option involves starting their own business. 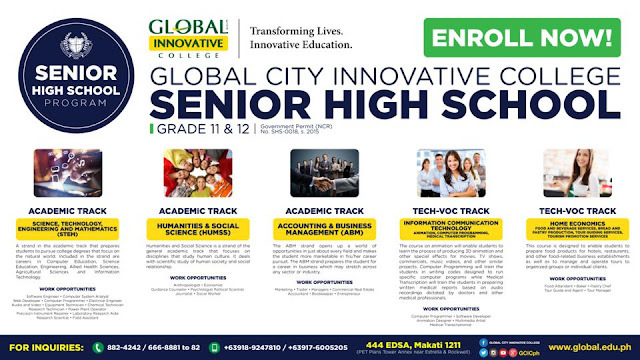 Know more on Global City Innovative College and its Senior High School program by visiting www.globl.edu.ph or calling 666-8881 to 82.